The idea for this picture was simple. A spacecraft fleeing from the impending doom of the occupants’ home planet about to be wiped out by a huge asteroid. Only one model was used for this picture. The rest was made up from primitives found in Bryce’s ‘create palette. The spacecraft model is the ‘J-fighter’ which is included in the Spacejetters 3D model collection. The planet and asteroid are sphere primitives with materials applied and tweaked in the ‘materials lab’ to get the right coloring and effects. The first step in the creation and composition of this picture was to set up the two main sphere primitives which would represent the planet and the asteroid. 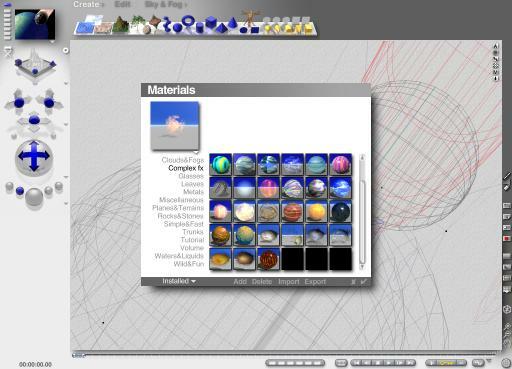 The planet sphere was resized and had the standard Bryce material ‘Weather map’ assigned to it. This can be found in the ‘Complex fx’ presets library. 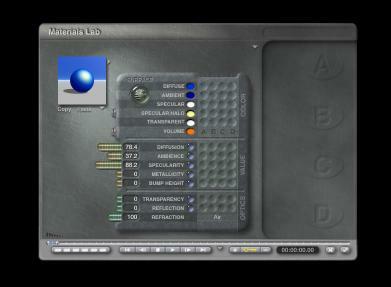 For the asteroid the preset ‘Luna’ was applied, which can also be found in the ‘Complex fx’ library. 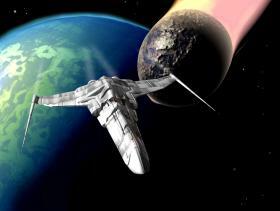 To create the fiery tail of the asteroid another sphere was created and stretched into an elongated spherical shape. The material applied to this is called ‘Plasma fire’ If you download the template for this picture you’ll find it included and it can be saved to your user library. Fig.1 shows some of the fx presets I use which can easily be added to your materials library by using the ‘import’ option. To enhance the coloring and texture of the planet sphere I copied and pasted it then resized it slightly to a smaller size, then using the materials lab (select the sphere and click the ‘M’ tag) I changed the ‘diffuse’ and ‘ambiance’ settings to remove the pattern and deepen the coloring using a blue for both settings. With a little experimentation I soon found the right combination to achieve the desired result of having a deep blue planet with a greenish tinge of cloud cover. Perhaps a little too much green at first, but I knew that I could adjust these colors using Photoshop during the final stages of the design. The sky setting by the way was a plain black, appropriately called ‘simple black background’ in the standard Bryce sky palette. In this case the atmosphere, haze and fog settings are all turned off. However, it was still necessary to adjust the sun position using the sun/moon control set at an azimuth of 222.1 and altitude of 33.2 in the ‘Sky lab’ to get the correct lighting angle on the planet surface. Although this appeared to reflect too much surface light at first, once again I knew that I could correct this problem in Photoshop in the final stages. The final step in Bryce was to import the spacecraft model and apply a suitable material preset. In this case I used one of my own custom designed presets which gave it the metallic panelled effect. Below are the final 3 stages in the picture design. The first picture shows the saved bitmap picture which was rendered in Bryce (actual size was 1024 x 768) The second picture shows the darkened planet which was achieved using layers and the airbrush in Photoshop. In the last picture a few simple adjustments were made using the brightness and contrast options. A whitish streaking effect was also added to the spacecraft and a little bit of touching up around the cockpit area was carried out. The final touch was to add the blue atmosphere around the planet and some small stars in the background.